New Year’s Eve was pretty lazy in our house this year. Instead of going out, or even cooking a nice dinner like we have in the past, we were 100% lazy. Like making nachos and guacamole for dinner and spending the evening cuddling on the couch finishing the most recent season of Boardwalk Empire. I had one glass of wine and we were asleep by 10:30. OH WELL! I woke up New Year’s Day rested and hangover-free. Michael made buckwheat pancakes for breakfast. It was the first time he’s made them at home after trying them in a restaurant last year. 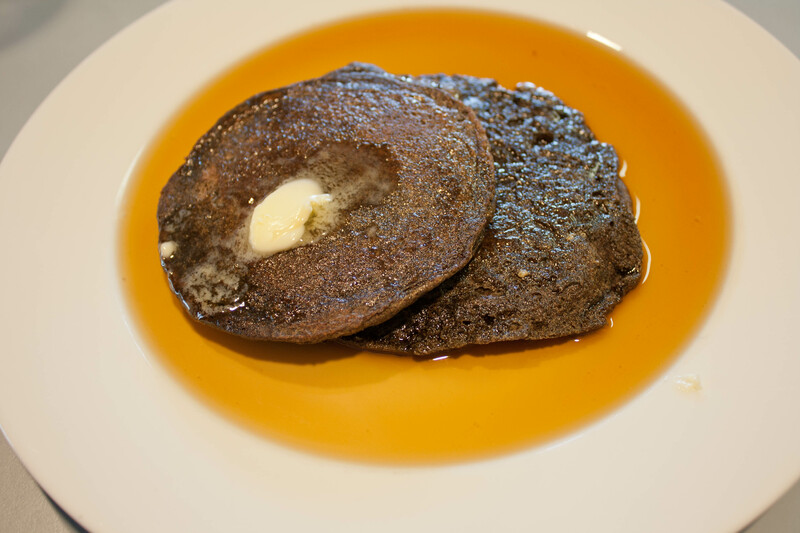 I wasn’t a huge fan of the buckwheat pancakes at the restaurant but that was in the early stages of trying to be gluten-free and just wasn’t a fan of any of the substitutions. In a medium mixing bowl, mix together the flour(s), sugar, baking powder, baking soda and salt. In a liquid measuring cup, measure out the buttermilk. Beat in the egg and vanilla extract. All at once, add the wet ingredients to the dry ingredients and mix until just combined. The batter should have some small to medium lumps. Preheat your skillet over medium-low heat and brush with 1½ teaspoons of butter. 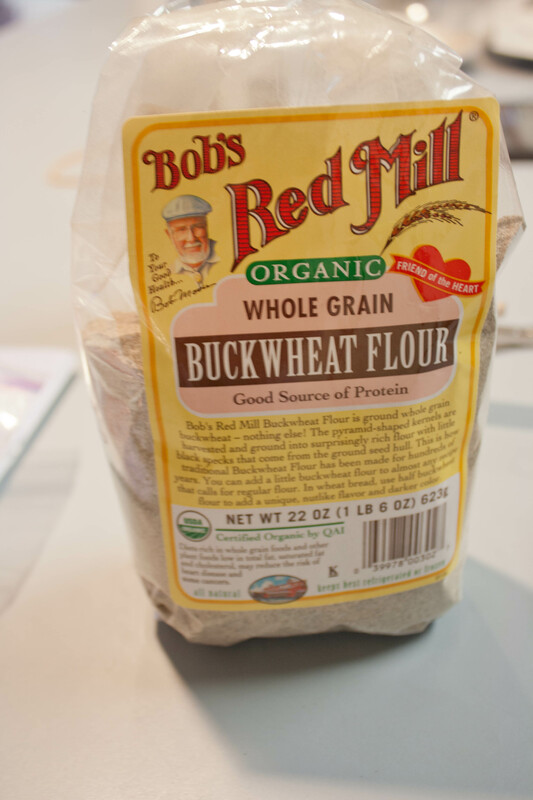 Give the batter a light swirl with a spoon in case the buckwheat is starting to separate from the liquid. Using a ¼-cup measure, scoop the batter onto the warm skillet. Cook for 2 to 3 minutes until small bubbles form on the surface of the pancakes (you’ll know it’s ready to flip when about 1 inch of the perimeter is matte instead of glossy), and flip. Cook on the opposite sides for 1 to 2 minutes, or until golden brown. Transfer the cooked pancakes to a baking sheet and place in a preheated 200 degree Fahrenheit oven to keep warm. Repeat the process with the remaining batter, adding more butter when needed. Serve immediately. Recipe adapted from Pancakes by Adrianna Adarme of A Cozy Kitchen. Yields 8 pancakes (plenty for 2 people). *Make your own buttermilk: combine 1¼ cups low fat milk with 1 tablespoon + ¾ teaspoon lemon juice or vinegar and let it sit for 5 minutes before using. 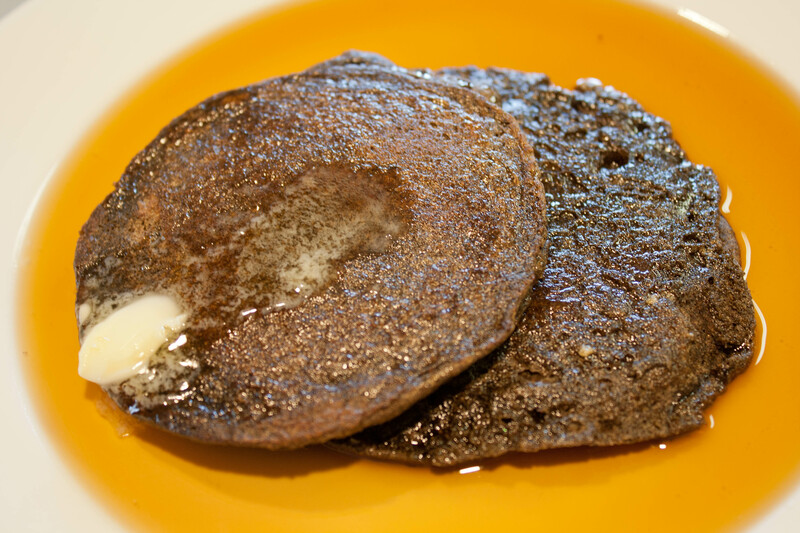 If you love these pancakes, you’ll also enjoy my buckwheat crepes recipe. A note on fluffiness: I tried forcing some extra height into these pancakes by using half whole wheat pastry flour and even folded in whipped egg whites, but neither made a significant difference. Then I took another bite and wondered why I was trying to make these marvelous pancakes something they’re not. They’re perfect just the way they are. The pancake mix was not appetizing looking. Like with the gluten free cookies I made a few weeks past, they were black in color. 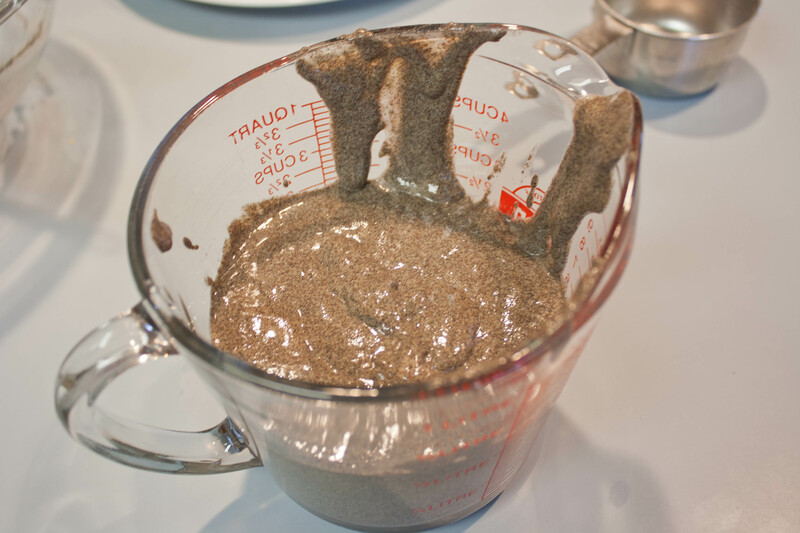 The pancake batter kind of resembled crushed Oreos–or sludge. And once again, we realized that with gluten-free cooking, a MIX is much better than relying on one kind of GF flour. Despite that, the pancakes were okay. They tasted alright. The consistency was pretty good–not as light and fluffy as regular pancakes, but decent. Michael made 6 pancakes (2 very large ones when the batter got away from him while pouring) but the recipe makes 8 smaller pancakes. If you make 8, it’s around 80 calories, 6 is closer to 100 calories each pancake. After breakfast we drove out to the Gorge for a hike. It was 47-ish degrees, not raining but slightly foggy, and a good day for a hike. 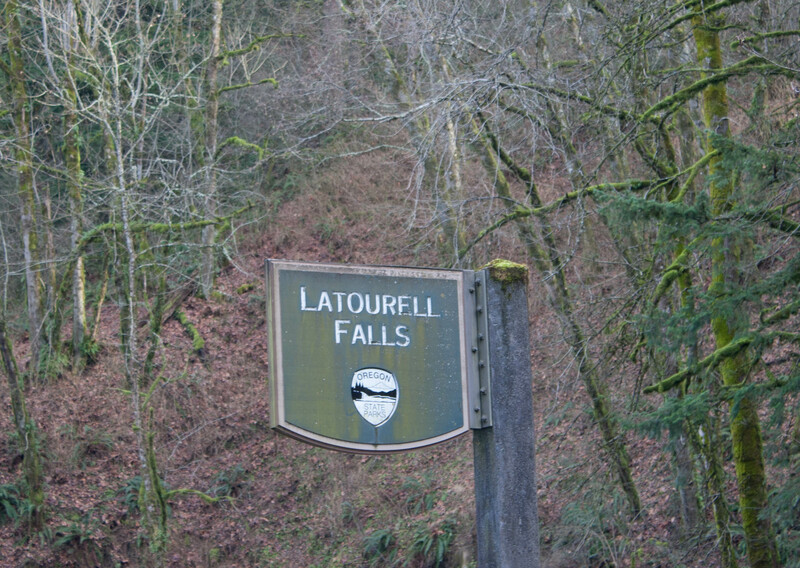 I chose Latourell Falls after reading “Creaky Knees Guide to Oregon Hiking“. It was rated as “moderate” in level but easy on the knees. It was also close to home. 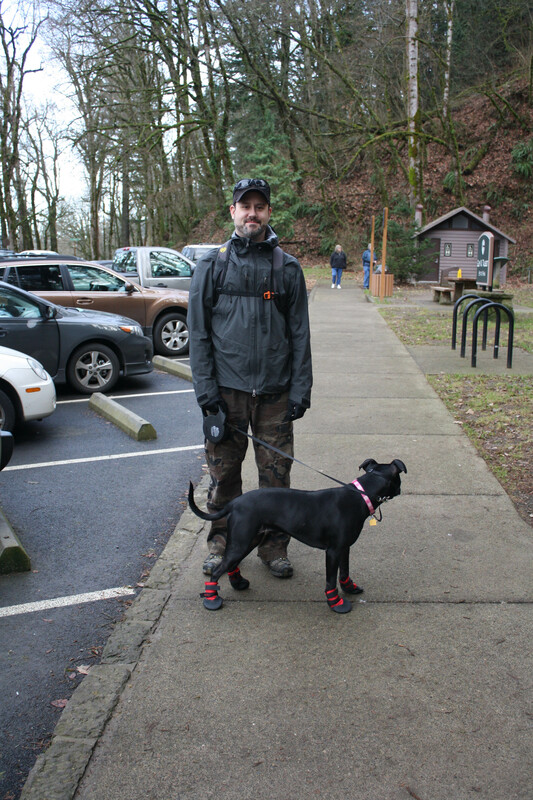 We packed up Bella’s hiking stuff, including her new booties! I got them mainly for snowshoeing but there hasn’t been much snow on Mt. Hood so that was out. Bella’s paws are pretty much healed but until they are 100% I didn’t want her to get re-injured so we gave her new booties a try. They are THE funniest things I’ve ever seen. When I first put them on her, she started flapping her front paws like she was trying to fly. When we got out of the car she sort of hopped and flopped around high-stepping until she got used to them. It was hilarious! Poor puppy! 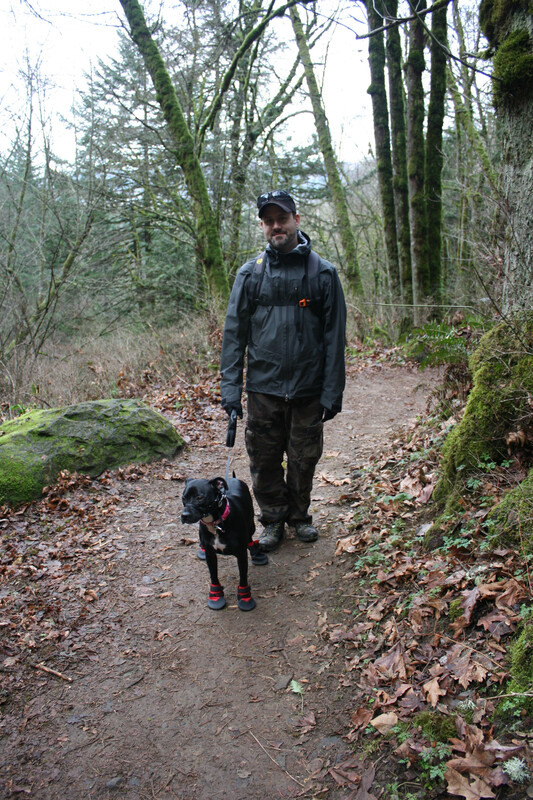 LOL She was really good while I put them on, though, and the booties stayed on the whole hike. Her paws were also perfectly fine when we were done–even better! 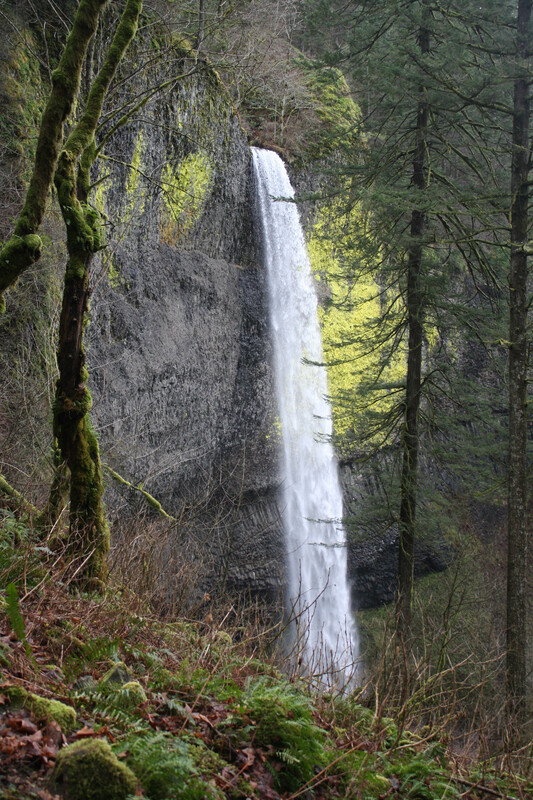 Latourell Falls is a 2.4 mile loop, but we ended up backtracking a little bit in the middle so probably hiked 2.5 miles total. 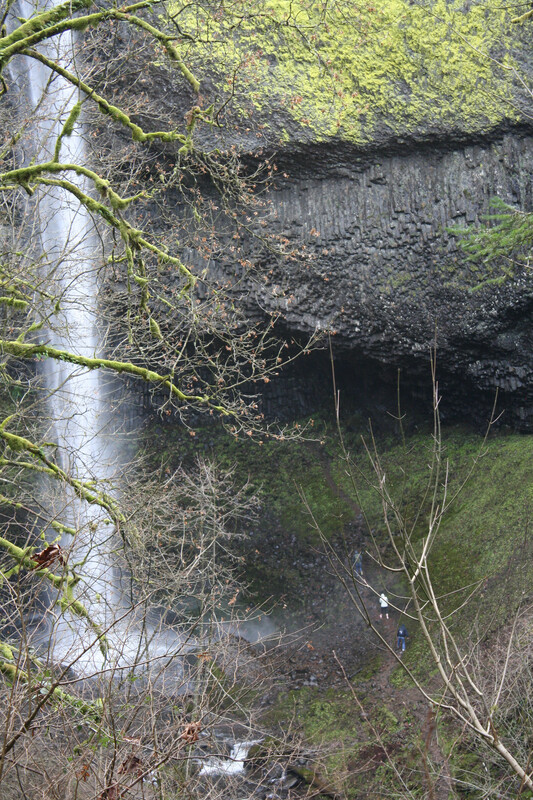 The big waterfall is right at the old highway where the parking area is for the park. It’s cool that you can see it right when you get there. There is a steep hike around the bend and then you are on the trail hiking along side the basin of the falls. 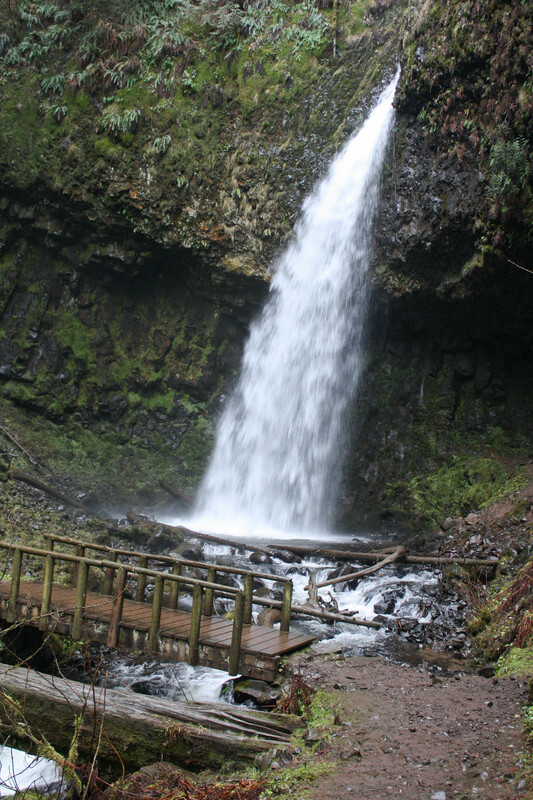 There is the main waterfall, then the Upper Latourell Falls is hidden in the canyon and forest about half0-way through the whole loop. The first part of the hike is a little steep and gets your heart rate up. The switchbacks go up and around the main waterfall and then all of a sudden you are at the top of it, walking over the top through the forest. Bella was doing pretty good on the hike. She met a LOT of people and didn’t bark at most of them. She even met a few dogs on the hike that she didn’t bark at. Progress! Everyone thought her booties were funny and/or cute looking. 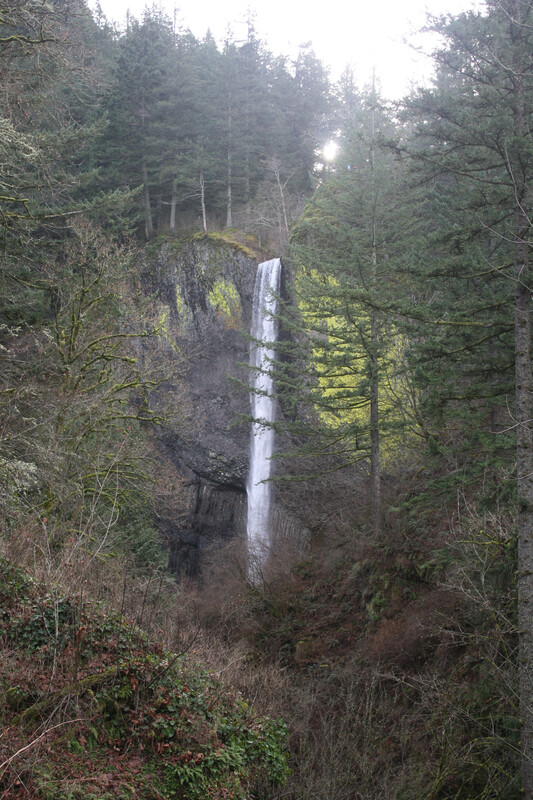 The above picture was the Upper Falls. It was pretty cool looking in person. 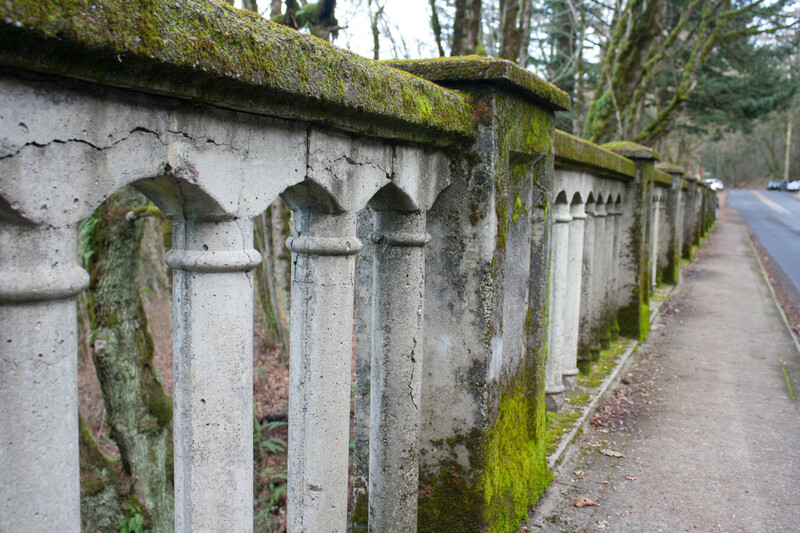 There were several wooden bridges along the trail crossing the creek. 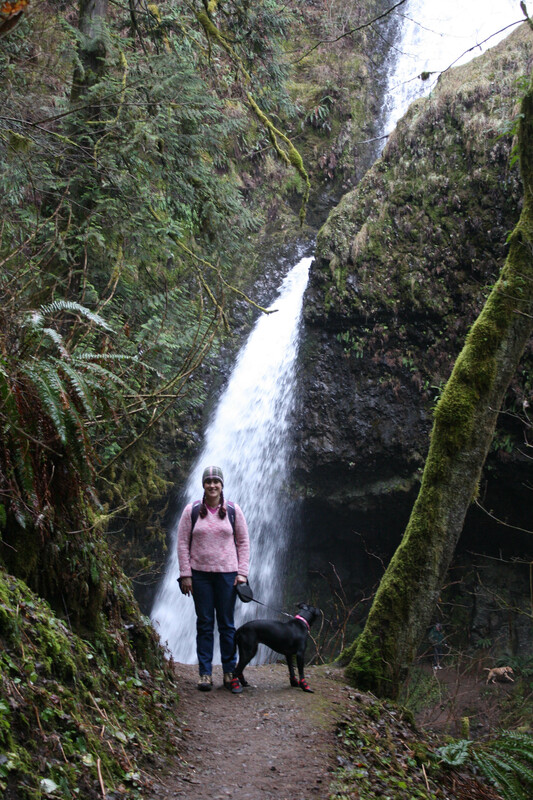 There was also a trail that lead underneath the waterfall but I didn’t want to get my camera wet so we skipped it. 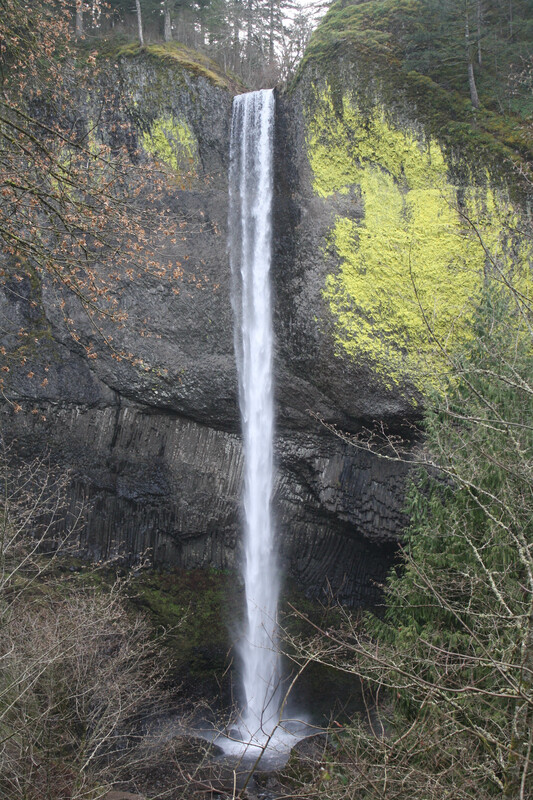 After passing the Upper Falls, the trail looped around the other side of the canyon and started heading up. 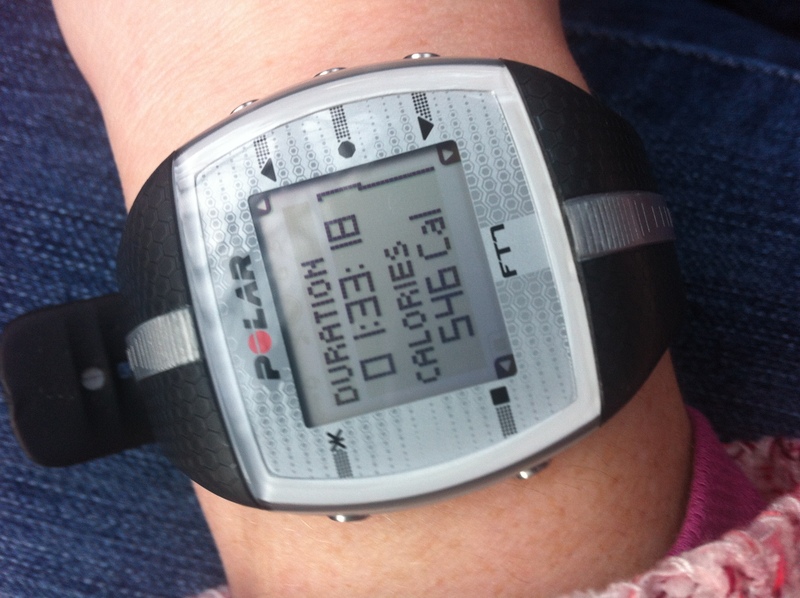 Again, the heart rate increased. This is where we backtracked a little bit–took an off-shoot of the trail that just lead down to a viewpoint and not much else. We double-backed and got back to the main trail. It went to the top of the hill and then looped back into the forest. At first we thought we might have taken a wrong turn because it was going the opposite direction of the parking lot (which we could see below) but it ended up being the right way. 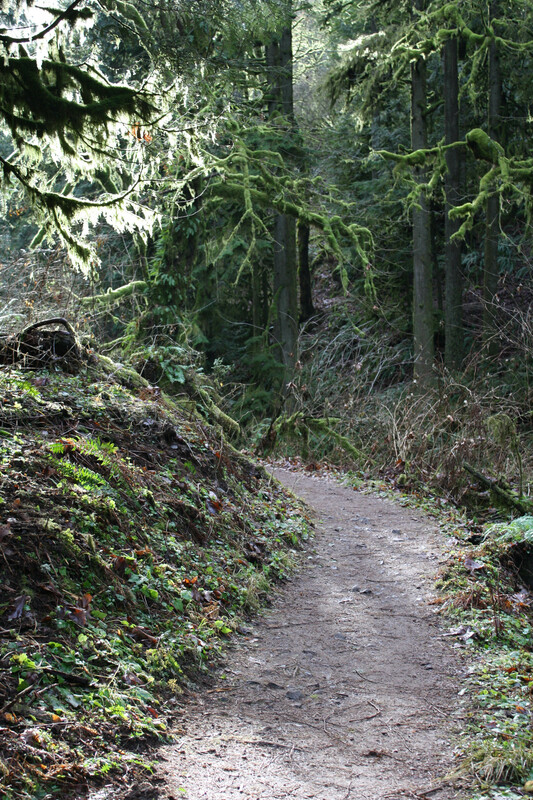 The trail went downhill through the forest. We got back to the road and the main parking lot for the park. 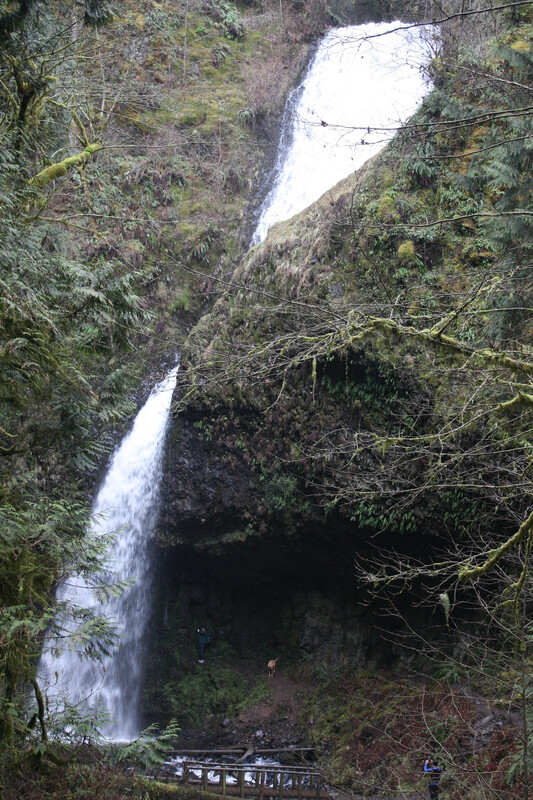 The whole time we were hiking, I kept thinking “How have we not done this hike before?” It’s right near a lot of the other free hikes in the Gorge–not far from Angel’s Rest and Multnomah Falls and yet I’d never even driven that far up the old highway to see that this hike existed! I’m glad we did it. Good start to 2014! On the way home we stopped at Edgefield for a late lunch/early dinner. It was around 3pm; kind of a weird time to eat but the pub was packed! Edgefield is a super cool place. 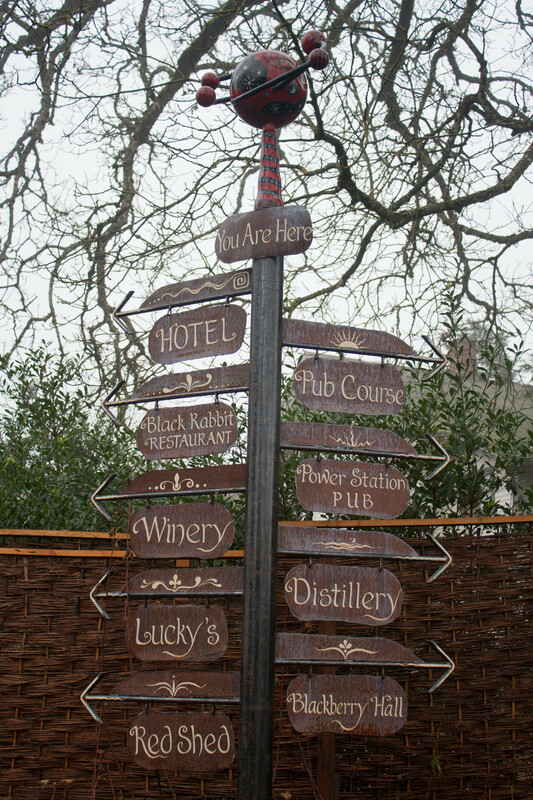 Part hotel, part concert venue, there’s a winery and distillery and a golf course. 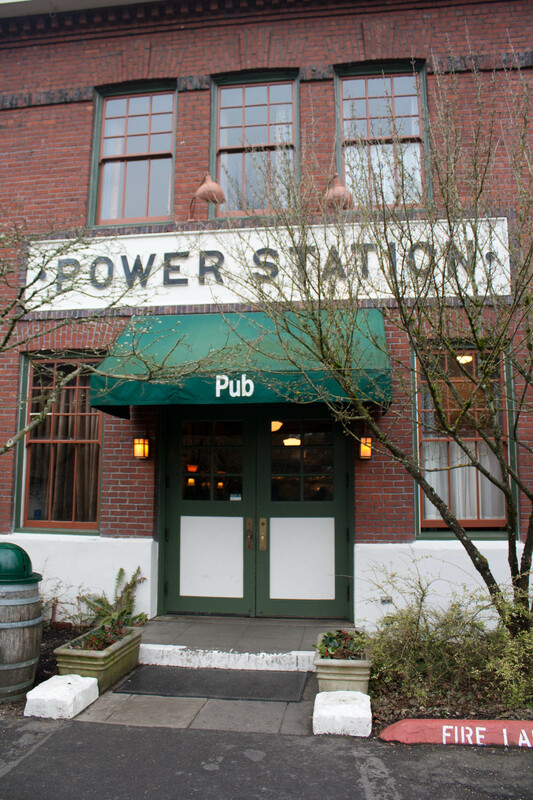 There are also gardens and some cute restaurants, bars and pubs in the old buildings. 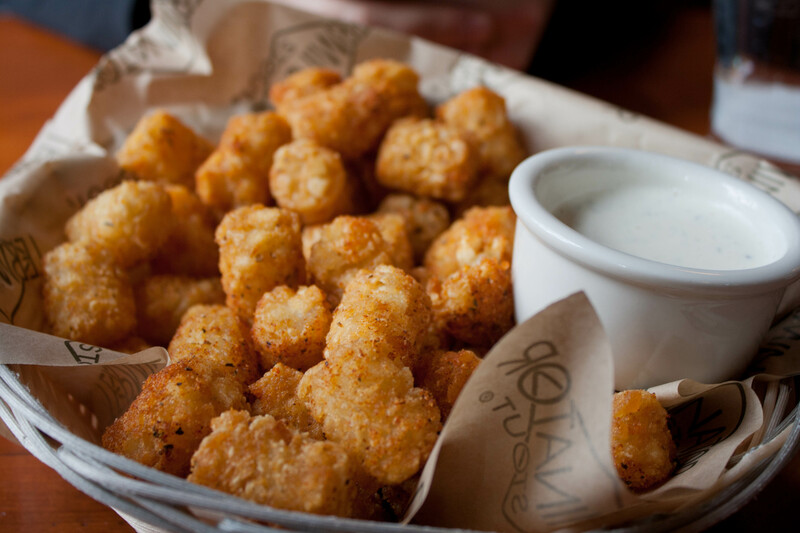 We shared a half order of the cajun tots–which were AMAZING. Salty, slightly spicy and perfectly crunchy. Seriously so good! 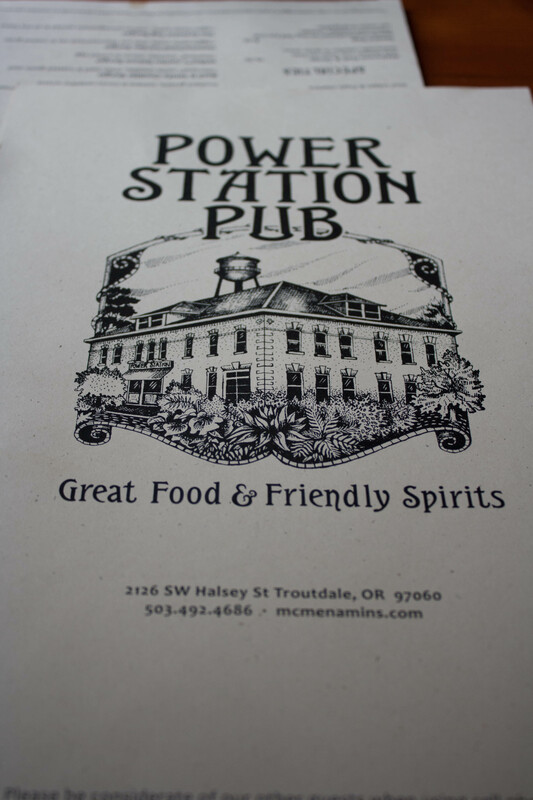 I got a pint of their Double IPA, which was pretty decent. Even though we’d just gone on a hike and I only ate 2 pancakes for breakfast, I wasn’t famished like I thought I would be. 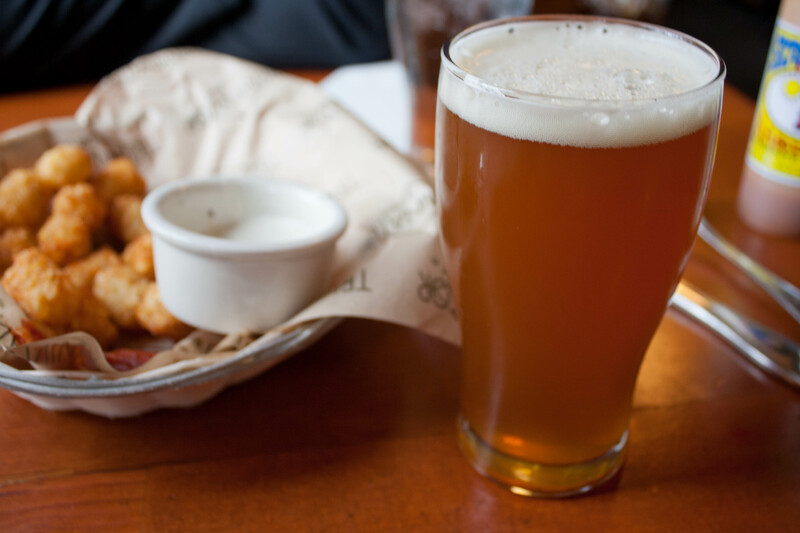 I ate a bunch of tots, had some beer, and felt pretty full. But I still “dinner” coming my way. 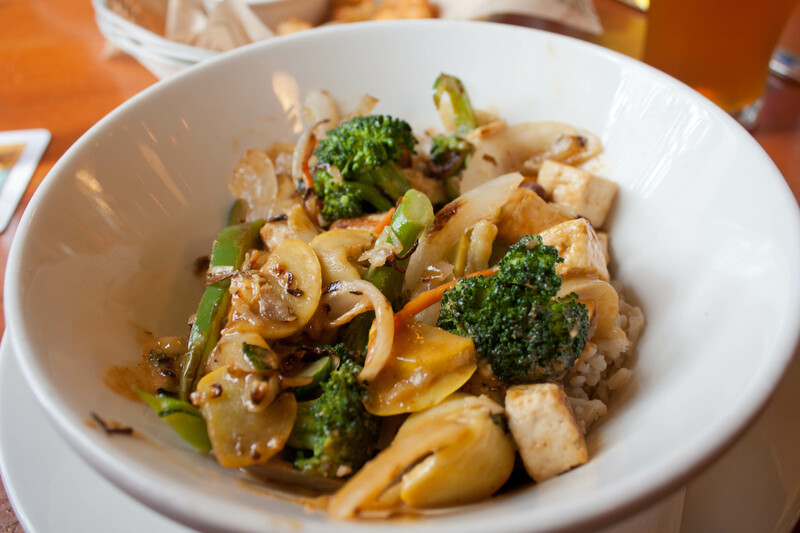 I ordered the Thai-peanut curry bowl with tofu, rice and veggies. It was okay, a little on the bland side. I’ve had better dishes similar to that at Laughing Planet. I ate about 1/3 of it and took the rest to-go. Michael got the Santa Fe Bowl (basically Mexican with chicken) and ate all of it. He loved his. We got home and the day started to catch up to me. We lounged around watching “Gravity” and relaxing before heading back to work the next day. How was your New Year’s Day? Love, Love,love those waterfall pictures. Reminds me of New Zealand. I’d LOVE to go to New Zealand someday…. That scenery is just amazing – my husband and I always talk about places we’d like to retire to, and the Pacific Northwest is always on the top of the list! Low key New Years are just fine for us – sadly, my husband is in the hospital right now – we went to the ER yesterday so hopefully we’ll have more info today. I understand that desire, but I think the tax system in Oregon would be a bad idea for a retiree. You could always live across the river in Vancouver,WA. Just a few minutes from Portland. That’s scary! Sorry to hear about Tony! 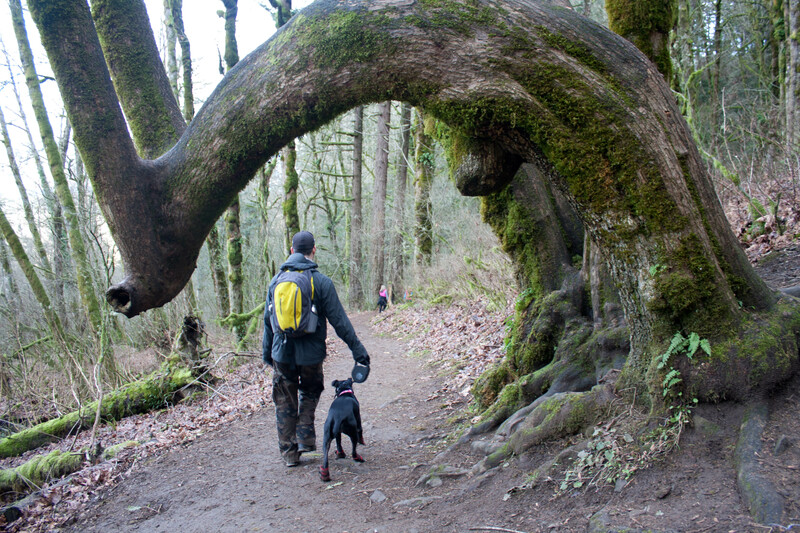 That hike looks awesome and I LOVE Bella’s booties. They’re so cute! They were pretty cute and SO funny to watch her try and walk in them. Wishing you a healthy & happy 2014! Thank you Andrea! I’m glad the photos turned out. Bella is so flippin’ cute! Happy New Year Lisa!!!! And to Michael and your furfamily! LOVE the pictures, the scenery and Bella’s boots!!! I’m glad they stayed on her paws!